Loving the font and layout... majorly impressed with J's header - wow! It is beautiful, Alice! Love the new look. Looks good. And definitely a non-serif typeface for the web; much easier on the eye. I love your new blog layout so muchhhh! And the header kicks you know what! And oh man I'm so excited to see your photos in a larger format! Props to J for his expertise. Love the new layout and the new header hand-drawn goodness! i love the new layout! has more girlie personality to it! it looks great! wat to go j! Loving the new skin! It looks really clean and I have to admit that the header is really quite impressive. Pen tool, oh yes! wow, he is amazing! and he *drew* it? wowzers. Love it Alice! Looks great! 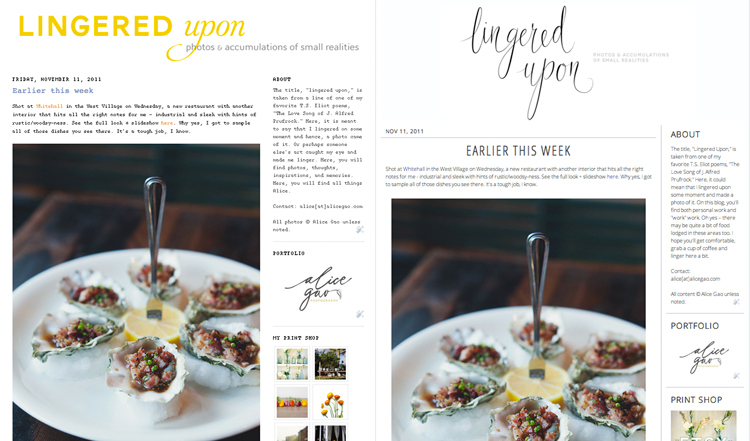 Your new blog design looks great! And wow, I can't believe that the header was drawn with the pen tool. I'm pretty familiar with illustrator but am not so great with drawing in it, let alone hand lettering. The new layout looks great!! And just forget about IE....nothing looks good in it lol! I love the new title - what a great job he did with the drawing of it! I love the make over. It's cute and elegant at the same time!